Trying to wrap my arms around the whole K-12 math curriculum so I can help students at all levels. Yikes! I have been itching to try an Open Middle math problem. As a tutor, I am always looking for ways to enrich and deepen the understanding of the students I work with, as opposed to just band-aiding their current math struggles. I finally got my chance last week. I chose this 3rd grade question: Draw three rectangles with a perimeter of 20 units. 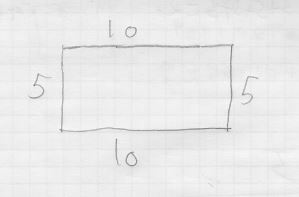 First, I asked my student to draw one rectangle with a perimeter of 20 units. Here is his initial attempt. Rectangle…check. Perimeter-is-the-edge…check. Perimeter = 20…not so much. We add the side lengths and he sees the total perimeter is much more than 20. Aha! 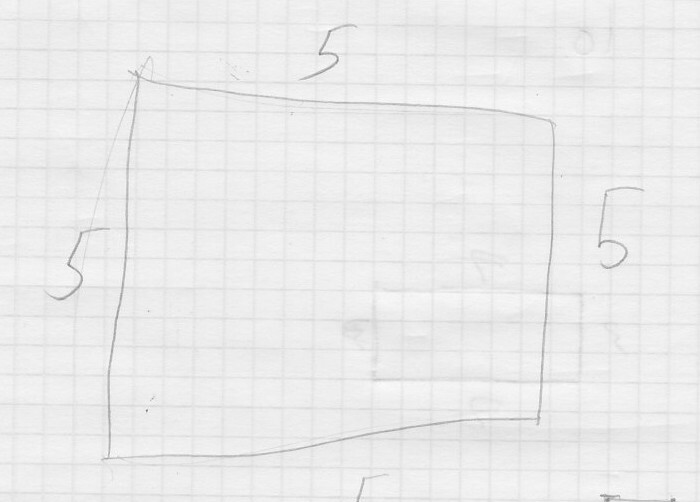 #1 “Oh, I get it!” Immediately, he draws a square and proudly labels each side 5 units long. Yay! Wonderful! Now: Draw another rectangle with a perimeter of 20. Hmm. Okay. Perimeter = 20…check. Rectangle…not so much. 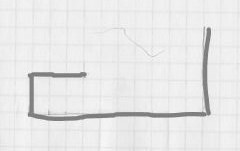 So I draw his “rectangle” to scale. Hmmm. What’s going on here? We talk about the properties of rectangles and his next attempt is a rectangle, but again the perimeter is not 20. Great! We have two rectangles with a perimeter of 20. Now draw another one. And we get to Aha! #3, at which point he stops drawing, and starts talking: “Or, the sides can be 2-8-2-8, or 1-9-1-9, or …! )” Pretty soon he’s listed all of the different configurations/rotations of rectangles (with integer-length sides) and HE GETS IT! This was more than an “aha!” moment; it was a groundswell of understanding – like a wave of comprehension crashing on the beach: I get it! I get it! I get it! And it didn’t happen after creating one rectangle, or even after two. It required him to come up with three different rectangles before he understood. SO fun to watch. It literally made my day. Can’t wait to try more Open Middle problems! This entry was posted in MTBoS, Open Middle, Tutoring on May 19, 2014 by galenaylor. When is a Line Not a Line? Truth to Power: Use Your Voice! Where can we find common ground and move forward? Sharing safe places to eat for people who cannot tolerate gluten. About writing, literature, and life, and where they intersect.